In a previous Tip, we suggested that clients and client behavior are the best indicators of lawyer excellence. Such lawyers may be specialists in esoteric legal disciplines, or they may be generalists who can answer any client need, but it is really not legal skills that define an excellent lawyer in client eyes. The very first Rule of Professional Conduct (1.1) asserts that "a lawyer shall provide competent representation to a client." But competence is actually a pretty low benchmark. 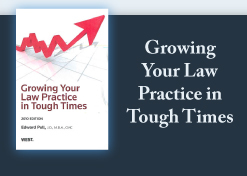 Clients see lawyers as competent, and on a skill level often cannot differentiate among lawyers. Above all, lawyers perceived by clients as excellent are in complete harmony with what the client desires. It is sometimes said that the best lawyers exceed client expectations. This is obviously a level of performance that goes beyond mere competence, but the nature and degree of "exceeding" can be hard to define. Client expectations may have originally been set too low. This is a no-win proposition because clients will inevitably expect even greater achievement next time. At some point it becomes impossible to continually exceed what clients want. The kind of mutual confidence that creates loyalty ultimately is the foundation for true excellence in a lawyer-client partnership. In this instance both sides work together to assess client needs and develop a proactive, preventive law approach. Lawyer and client make recommendations to each other about actions and decisions that are mutually beneficial. The bottom line is that excellence is defined by performance. Performance is a factor of many different things: communication, understanding and focusing on the client's objectives, use of technology, and specialized knowledge. The common thread that binds these elements of excellence together is communication. It's essential that the client knows what the lawyer is doing, and that the client approves of the tactics to be taken to achieve the client's strategy/goal. The lawyer can only provide services successfully by understanding the intent and desires and wants of the client, as well as the client's needs. These may not be the same. Lawyers must communicate with clients at their level of understanding, and do so frequently. Truly excellent lawyers show clients how highly they are valued by how much lawyer communication and interaction they receive. Communication reinforces reliability and trust, and those values are the foundation of perceived excellence. We continue to create new intellectual property to help lawyers dramatically improve their profits and reduce their stress! Our latest development is The 3-Dimensional Lawyer, discussing management, marketing and financial issues that challenge lawyers in today's world. Click here to learn more and/or order this exciting new product.